Is it OK to drill through a jack stud/full stud pair to cut a hole for water heater drain pipe? I just had a new water heater installed in my garage. My city building / plumbing codes require that the water heater overflow drain be drained to the outside of the house. The heater stands next to a wall separating garage and house that is about 10 feet from the garage outside wall. There is a door in the garage wall to outside right at the corner of the wall the heater is next to. To run a drain pipe from the water heater to outside, the plumber simply ran the pipe along the wall and supported it with braces. BUT - to get to outside, a hole needs to be drilled along the long side of the jack stud and king stud framing the door. BUT the plumber stopped short of going through the outside wall because of reluctance to cut a hole through the long side of the studs. The city inspector has failed the installation. Is it really OK to drill through the jack stud/king stud and it won't weaken the wall? There are general guidelines for dealing with cuts in wood framing. For load bearing the basics are that you can notch 25% of the stud or 40% diameter for a hole. Note: Notches should not be square - this provides a weak point in the stud. Half circle your notches if you can. Now there are ways around this if you need a bigger notch or hole. In my area local inspectors will let you double up the studs and go 35%S and 60% respectively on load bearing walls. This doubling up is a one time allowance - I couldn't do a whole wall like that. For electricity these guidelines are more than enough to run several lines through a wall. 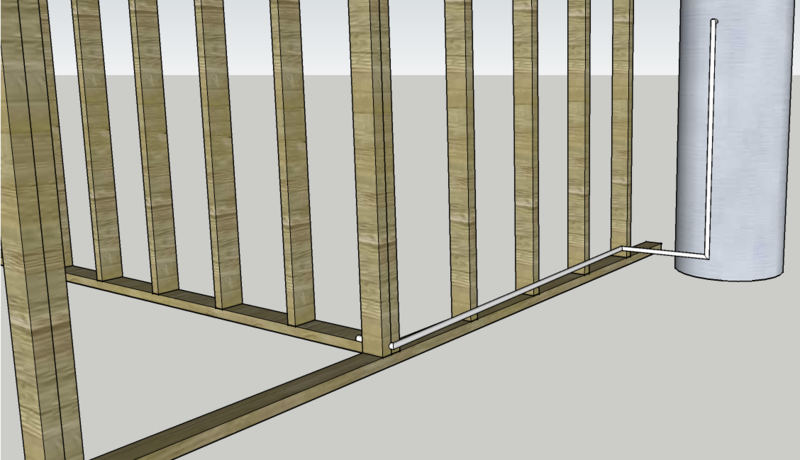 For plumbing though you might need to use different width boards (frame wall with 2x6) or use structural bracing. Note that in the picture you see both wall plates (which offer little structural support) and bracing around the plumbing cut-outs. 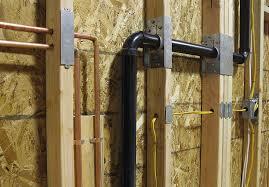 When you buy bracing for plumbing there will be guidelines on the use of the product. Follow those to figure out hole and notch sizing. For this instance: If I read right you need a pipe to run perpendicular to the studs. The same rule applies. I we are talking 2x4 construction that means that you have 1.5 inches going across. Mean you can notch 3/8" which isn't much. There are several ways to handle this is you have a larger pipe (a heater shouldn't need much though) needing out. You could notch a little out of each jack and king. Would be enough for a 1/2 inch pipe and I would feel perfectly fine about a half inch hole with a jack and king supporting each other. You could rip the king out. Flip the king stud around sideways and install 2 kings and bore a hole through the center of it. If you needed a bigger hole you can use 2x6. Buy a structural brace/shoe. With a properly installed shoe you can cut out the whole stud and have a ton of space to run things. Downside is they are expensive (relatively) and getting what you want isn't always easy. I am sure there are other options but I would need to see a picture. I would also add if you want to get it passed by local municipality then I would just ask your inspector what he/she wants. No, it's not ok to essentially cut a jack or king stud into two pieces. In addition to providing support to the wall from the door opening and closing, they are carrying all the load of the wall over the door via the header. You'll need to find a different location to run your drain line. It depends on the diameter of the hole (i suspect 7/8" or so hole for 3/4" copper pipe) and it depends on what other studs are in proximity. 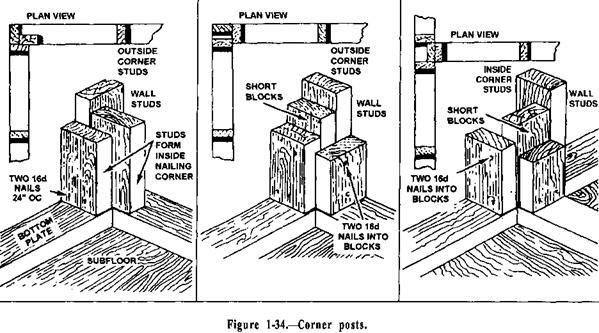 Since the king/jack of the passage-way door are in a corner, there are other studs within 0-5" of the king/jack, most likely two others, possibly three others. As @BMitch comments, a 1" hole across the width of a 2-by removes 2/3's of the wood, and is a significant structural change ... to that stud. Nearly all species of framing lumber have a 'parallel' compressive strength significantly greater than 5000 PSI. After drilling a 1" hole in a 2x4, the narrowest cross section will be 3.5" x 0.5" = 1.75 square inches. As a first estimate, such a 2x4 could independently directly support a 1.75 x 5000 = 8000 pound load, or an 8-ton loaded header, which is equal to the dead+live full load of at least 160 sqft of a 2nd story plus roof. However, the second floor and roof loads are typically split between 2 parallel walls, so the figure is more akin to 320 sqft of a 2nd story plus roof. Yet even if the 5000 psi figure is meant for 8x8 posts, and is off by a factor of 10 when applied to cross-sections on the order of 3.5x0.5, the drilled out jack stud could still support 8 200 lb people standing on top of the header. There is not even enough room for 8 pairs of feet on 36" header. So while 1" hole in a 2-by takes away 2/3rds of it's compressive strength, the compressive strength of framing lumber is so great that the resulting 2-by is still overly sufficient as a jack stud. In the OP's situation, due to the fact that king/jack are in a corner, the wall is significantly over-built from a structural load-bearing perspective. In fact, from a structural load-bearing perspective, nearly all corners in general are significantly over-built because they are framed with one or more extra studs that are there merely to provide a backing for the edge of sheetrock. These extra studs are not needed to satisfy load bearing requirements. So, from the structural viewpoint of the wall, a 1" hole is a non-issue in the OP's situation. Go ahead and drill it, preferably with half the hole in the king stud, and the other half in either the corner stud. If the king is serving as a corner stud, then half in the king and half in the jack. Or half in the jack and half in void between the jack and the door jamb (temporarily fill the void to drill). From a code viewpoint, the inspector might understand this, or might not. Ask him/her before you drill. Not the answer you're looking for? Browse other questions tagged plumbing water-heater framing municipality or ask your own question. Studs cut to fit the sewer pipe — is it ok? How to drill and waterproof a hole in cinder block for PVC drain? How should a water heater drain pan be installed on a concrete slab floor? Installing a wall vent when stud blocks the opening? What could explain a large hole above water heater vent pipe? Why does my water heater's drain line rejoin the outlet pipe? Cutting a 2" hole through a load-bearing 2x4 stud for a washing machine drain? How close to the top of a structural stud can I drill?